Author: Case, John Set In . . . Description: "And on the Seventh Day, He rested." From the New York Times bestselling author of The Genesis Code and The Syndrome, here is a spellbinding new thriller of international intrigue, religious prophecy, cutting-edge science, and unrelenting suspense. For Danny Cray, a struggling artist and part-time private investigator, the offer is too good to be true. A wealthy, enigmatic lawyer, Jude Belzer, would like to retain Danny for a little damage control. His client, an elusive billionaire named Zerevan Zebet, is the target of a vicious campaign in the Italian press that threatens to destroy his reputation. Belzer wants Danny to find out who is responsible–and he will pay handsomely. Danny’s only lead is the meager estate of a recently deceased professor of religious studies, a man so deeply terrified that he buried himself alive in the basement of an isolated farmhouse. Belzer swears that if Danny can get at the late professor’s files, the conspiracy against his own reclusive client will unravel. It’s the perfect assignment, in a way, and Danny can sure use the money. But the more he probes, the more apparent it becomes that nothing is what it seems. There is something he isn’t being told. Something that’s not quite right. Something dark, fast, and sinister that’s coming at him from behind. 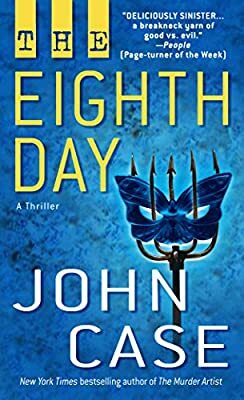 From the powerful world of Washington, D.C., to the ancient grandeur of Rome, from the mysteries of Istanbul to the high-stakes drama of Silicon Valley, The Eighth Day is a briskly paced, globe-trotting thriller of electrifying suspense. Packed with unexpected reversals and astonishing twists of plot, this is John Case’s most gripping novel to date.